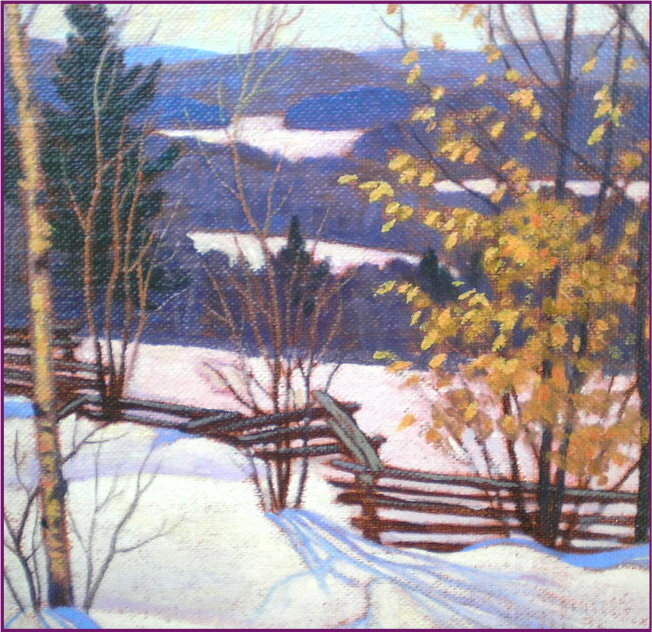 Titled Verso: "Rail Fence, Winter (near Dwight, Muskoka)"
Size - H: 8 in. x W: 10 in. 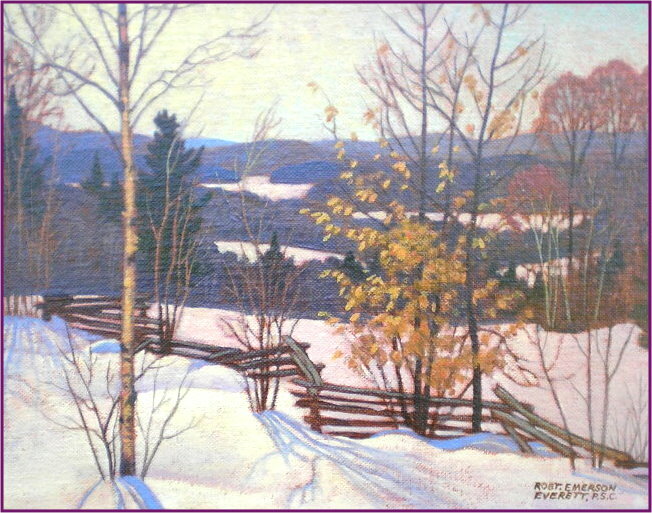 Robert was born in Bracebridge, Ontario in 1920 and, with his father, owned and a pharmacy in that town for many years but also passionately enjoyed painting in his spare time. 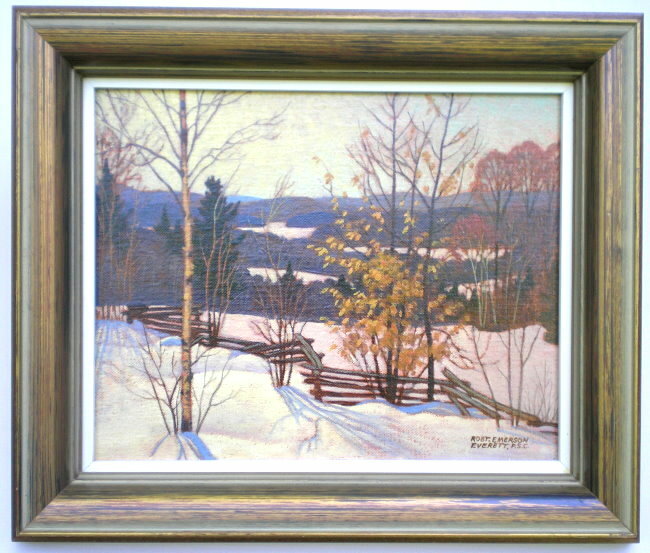 By 1973 he retired and turned to his passion of painting full time, producing landscapes mostly of Algonquin Park and the Muskoka area where he sketched in oil outdoors on small 8” x 10” panels. He is known for having painted many well-known Muskoka landscapes and frequently drew his inspiration from the Algonquin Park wilderness that was so familiar to the Group of Seven artists. 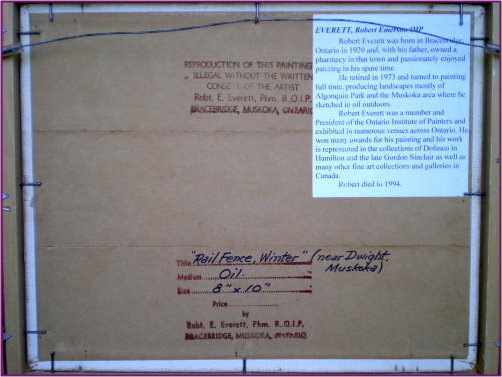 Robert Everett was a member and President of the Ontario Institute of Painters and exhibited in numerous venues across Ontario. Bob won many awards for his painting and his work is represented in the collections of Dofasco in Hamilton and the late Gordon Sinclair as well as many other fine art collections and galleries in Canada. Robert passed away in 1994.